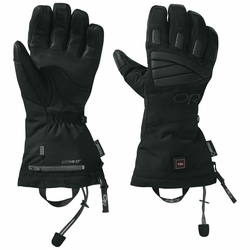 Outdoor Research Lucent Heated Gloves. If you’ve struggled to find gloves that keep your hands warm in bitter winter weather, turn to the Lucent Heated Gloves and Lucent Heated Mitts. Built with ALTIHeat™ — a rechargeable battery-powered heating system that provides staying power when you’re determined to be on the mountain from first chair to last call — the Lucent Heated Gloves and Lucent Heated Mitts provide staying power for the coldest cold smoke. GORE-TEX inserts make them waterproof, and lightweight synthetic EnduraLoft™ insulation adds extra warmth and cold-weather protection. Other features include a fleece palm lining, molded EVA on the back of the hands and abrasion-resistant goat leather strips on the palms.